I. 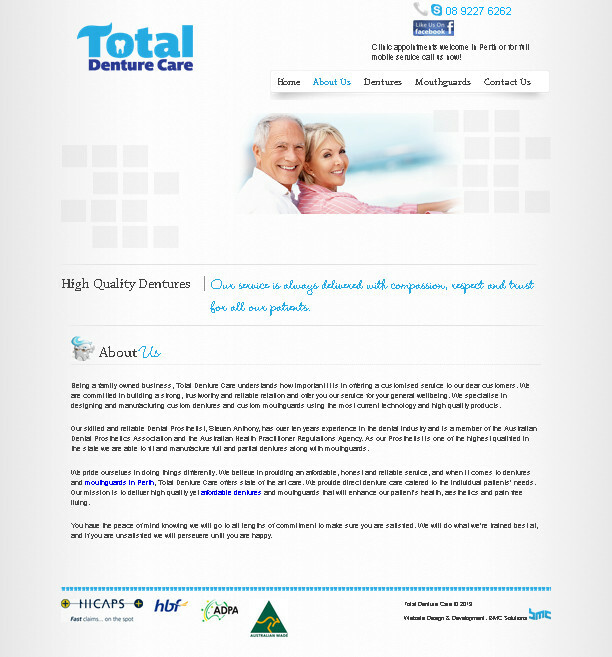 Company Info Total Denture Care is a family owned business that understands the importance of offering a personalised service to their customers that is built strongly on comfort, trust and an ongoing commitment to care for their general wellbeing. 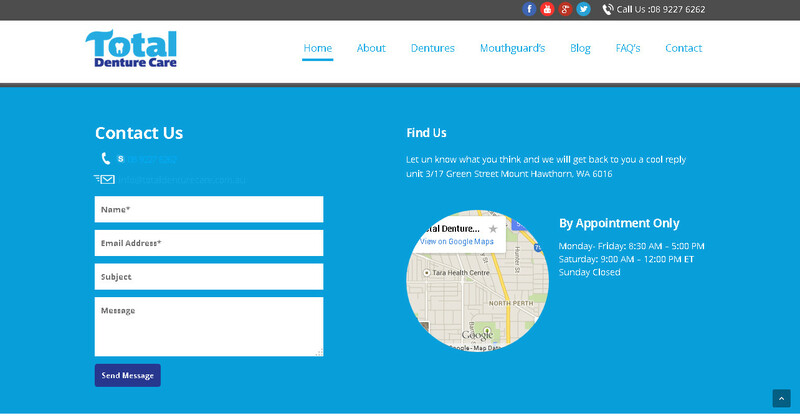 They are leaders in designing and manufacturing custom dentures in Perth and custom mouthguards using the latest technology and high quality products. Their skilled and reliable Dental Prosthetist, Steven Anthony, has over ten years experience in the dental industry and is a member of the Australian Dental Prosthetics Association and the Australian Health Practitioner Regulations Agency. As their Prosthetist is one of the highest qualified in the state, they are able to fit and manufacture full and partial dentures along with mouthguards. They pride themselves in doing things differently. 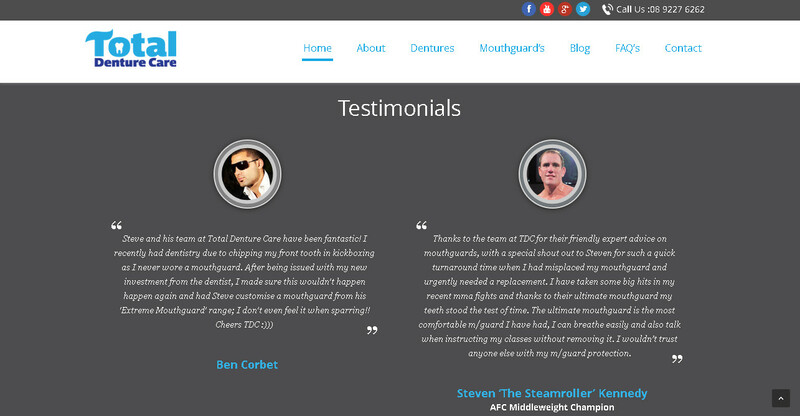 They believe in providing an affordable, honest and reliable service, and when it comes to dentures and mouthguards in Perth, Total Denture Care offers state of the art care. 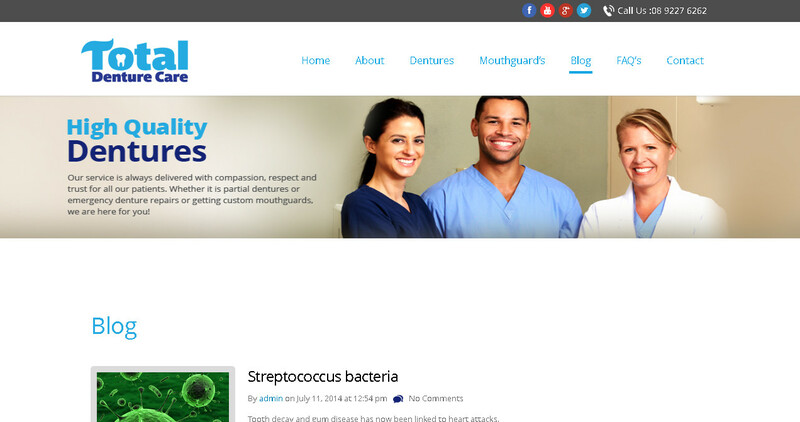 They provide direct denture care catered to the individual patientsâ€™ needs. Their mission is to deliver high quality yet affordable dentures and mouthguards that will enhance their patientâ€™s health, aesthetics and pain free living. I. Project Overview Total Denture Care has been in the dental industry for over 10 years, and has set up an outstanding reputation with their clients. 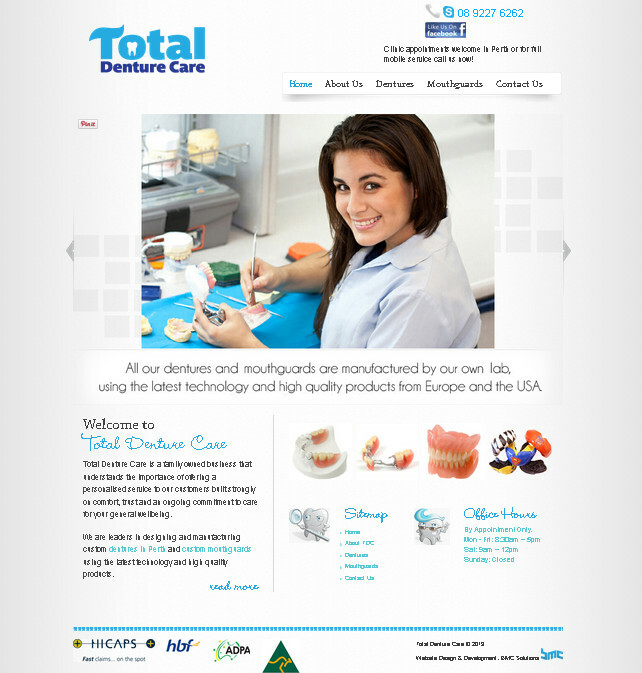 Recently Total Denture Care has thought of giving their companyâ€™s website a total makeover so that it can effectively showcase their companyâ€™s excellence and variety of products and services. 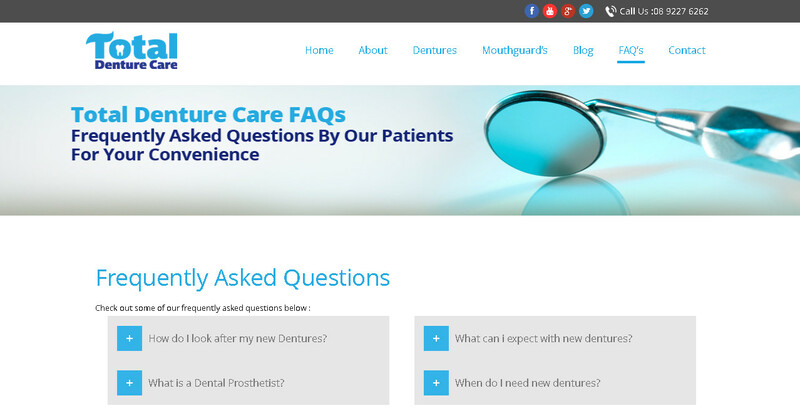 Our web development team at BMC Solutions were contacted by Total Denture Care to make their website look more professional and mobile-friendly to its clients in order to gain more engagements and leads being converted into a customer. Because here at BMC Solutions, we believe that well-organised website contents enables people to formulate enhanced decisions and find the things theyâ€™re looking for quickly, without being bothered by the unnecessary contents of the website. But first of all, before we proceeded to the website development, we performed a research regarding the target market of the business and the services that might improve the websiteâ€™s overall performance, lead generation and online presence. 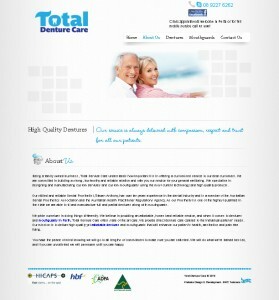 Here’s the old website: III.Â Â Â Â Â Â Â Â Â Â Â Our Solution We gave Total Denture Careâ€™s company website a new look by using a multi-purpose and responsive theme and building a landing page that showcases the look and feel of the business effectively. We also added some website features that might be helpful in lead generation such as Testimonials, Google Maps, FAQs, and Blogs. After making the website running, we made techniques that can get the website listed on Google and other search engines using the keywords that might be used by their target customers when searching for their products and services. Testimonials â€“ We believe that itâ€™s sometimes a great thing to show off some good testimonials on your website because itâ€™s a reputation earned by your company that can help customers build trust on your business. Blogs â€“ Contents are also essential to a website because we believe that content development reaches out to two viewers, prospects and search engines. FAQs â€“ This section is a no brainer. It makes it easy for the customers to look for answers to their questions on your website without having the need to send queries on your website every now and then and you answering them repeatedly. It avoids the customerâ€™s hassle of waiting for the answers to their questions regarding your companyâ€™s products, services and terms. Google Maps â€“ It can help your business website to be visible on the search engine and in the Google Places.